No smoke without fire, they say. Think of all the campfires that have blown smoke into your face. The bothies and stone shelters that filled with black, acrid smoke when you tried to warm yourself after a hard day’s hiking and ended up choking instead. You accepted these things as part of the give and take of life on the trail. No sunshine without showers. No still evening without flies. No fire without smoke. You needn’t have accepted them at all. Muslims have known for centuries that a purer, smokeless fire exists. Myths of the jinn, supernatural beings, emerge from such knowledge. However, you don’t have to be a conjurer to create smokeless fire! All you need are simple materials and a little practical knowhow. This article will give you all the information you need to produce a smokeless campfire. Read on to learn how to banish smoke from your next camping trip! Has the reference to the jinn made you sceptical? Need a little convincing? If fuel is efficient it makes use of all the oxygen available to it, full combustion takes place and only water and carbon dioxide are released into the air (no smoke). However, if the fuel is inefficient then an incomplete combustion takes place – and that’s a lot messier. In this case, hydrogen, carbon and oxygen are produced and Char and ash are another unpleasant byproduct of incomplete combustion. Fine, I hear you say, smokeless fire is possible, but what are these magical fuels that fully combust and produce no mess. Dry materials with a high concentration of carbon are what you’re looking for, but where can they be found? There are significant advantages to sourcing the fuel for your fire in the wilderness. For one thing it means that you don’t have to lug pieces of wood or chunks of coal along the trail! When it comes to sourcing material for smokeless fire there is more or less one simple rule to follow – the dryer, the better! Even dry animal dung will burn! Anthracite and coke (not the drink) are purchasable smokeless fuels. Both of them are coals or derivatives of coal with an extremely high carbon content (around 90%). Not only does anthracite produce no smoke but it results in blue flame so if you fancy a different kind of ambience from your fire it may be your go to option! Besides the pretty obvious advantage of not choking on thick black smoke while you’re trying to toast marshmallows, are there any other reasons to go to the effort of building a smokeless fire? We trek into the wild to enjoy nature, not to despoil it and limiting the release of acrid smoke is certainly beneficial to the environment. A purer fire releases less gases into the air and is far less likely to disturb nearby insect, bird or animal life – not to mention those equally delicate beings, fellow campers who won’t be shy about letting you know if smoke is drifting into their tents! Smoking cigarettes isn’t good for you, everyone knows that. How many equivalent packs of cigarettes are you inhaling if a huge fire, fed on inefficient fuels, siphons smoke into your lungs? Burning fuels like gasoline and diesel will be even worse for your health since their fuel contains toxic elements! It’s also less likely you’ll clothes will smell for weeks after sitting next to a smokey fire. Back in the real world you may just want to make a fire without your neighbours complaining! Perhaps you’re a simple fan of efficiency. The same amount of an efficient fuel will generate light and heat for longer than in inefficient fuel. As the folks at survivalmastery note this will also improve your campfire cooking. We’re all partial to smoked meats from time to time, but it’s nice to at least have the option of unsmoked meats. Now the important bit! How do you actually go about making a smokeless fire? you could build a dakota fire pit. Dakota pits are also known as stealth pits thanks to the low levels of smoke they produce. This is thanks to the key element of their design: a tunnel that exists solely to feed oxygen to the base of the fire. High levels of oxygen in combination with an efficient fuel is a recipe for smokeless or low smoke fire. Most of us, however, won’t have the time or energy to dig tunnels for a fire. As besurvival point out, Dakota fire pits are also prone to collapse and other problems. 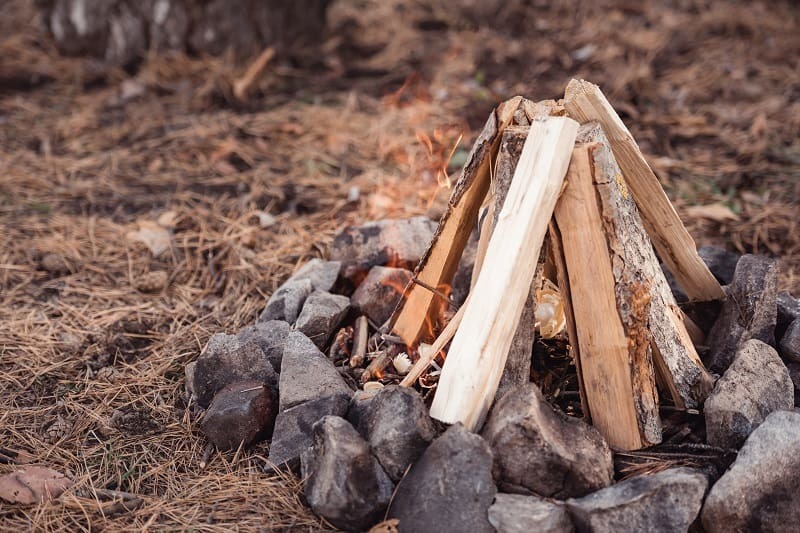 Place smaller rocks on either side of the big rock to create a fire circle but, crucially, leave the front of the fire open to allow oxygen in. Smokeless fire is more than just a pipe dream. 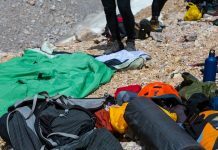 Fires will always release some vapour but following the steps in this article should allow you to minimise any unpleasant byproducts of the flames that provide so much comfort on the trail. Don’t take our word for it, though, get out there and experiment! How smokeless can you make your fire? Let us know in the comments section. Build responsibly and minimise any after-traces of your fire!